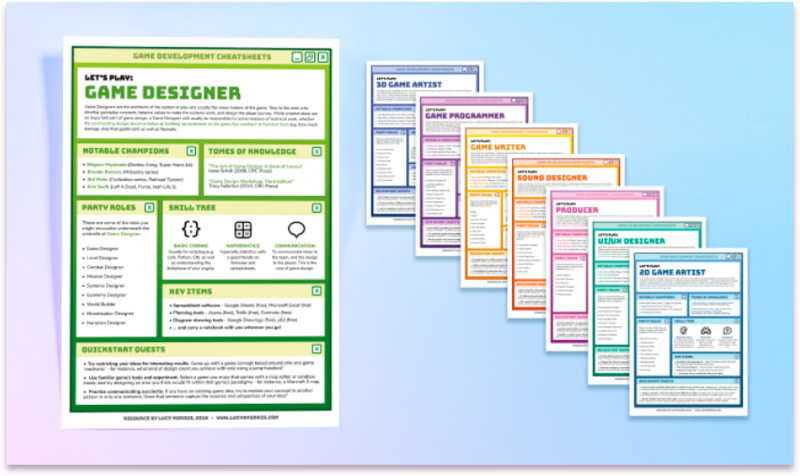 The information includes: 'Notable Champions' (some of those well-known in that field), 'Tomes of Knowledge' (good starter books), 'Party Roles' (adjacent roles or roles under the same discipline umbrella), 'Skill Tree' (core skills that are useful), 'Key Items' (programs and tools you could try), and 'Quickstart Quests' (little exercises to give you somewhere to start). 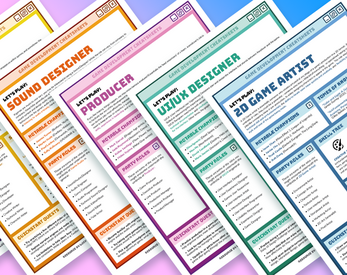 These sheets are intended for all ages, but please note that any websites linked may have content or interactions that vary in quality or rating (like any of the internet). The .pdfs are best viewed in Adobe Acrobat. 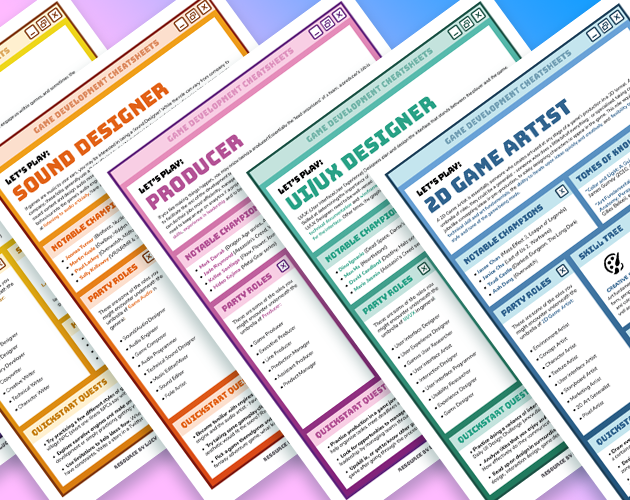 Once you have purchased this pack, you may print the sheets out and reproduce them as much as you like - the previous set has worked especially well for game dev meetup groups, university clubs, schools and more. Go nuts! Spread the game development love! If you are a for-profit institution that would like to use this resource, please contact me for the for-profit rates. Thank you! All proceeds go towards my ability to make more cool resources for you and your community, so it's a win-win situation eh. In either situation, my attribution must not be removed from the bottom of any of the sheets because hey. That's not nice. Please contact me if you would like to alter the sheets for the purpose of translating them so I can assist you. Special thanks to Maris Tammik (@fuzzblob), Martin Kvale (@MartinKvale) and Elliot Hayward (@likelyelliot) for their input on this project. Go check them out! Note 5/8/2018: Fixed two tiny spelling errors on the Sound Designer sheet. Redownload for the fixed copies if you own it!